“Gobble, gobble, gobble, proud turkeys proud turkeys. Gobble, gobble, gobble proud turkeys are we. I taught the above song to preschoolers when I was a Pre-K teacher. Later, I sang it to my own children. Now, I sing it to my turkeys. They strut and spin silently until the high-pitched gobble at the end. Then they join me. Some of the time. I think I finally found my enthusiastic audience. 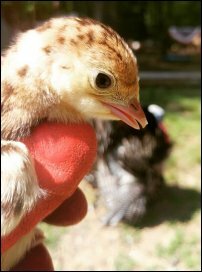 If you read my previous post, Heritage Turkeys on the Homestead: Get a Load of These Gobblers, you can read how we came to love heritage turkeys. How to go about breeding them seemed easy. Mate. Lay eggs. Eggs hatch. Presto. Not get involved. However, the reality of turkey breeding was far from easy. My head hurt just writing this and sorting out the timeline of events. It was a seven-month ordeal. Although there was still snow on the ground, the temperatures began to slowly rise. Bird call started to fill the surrounding woods. In the spring, our turkeys began indulging in hanky panky. Well, Rocky did, at least. With all four hens. By asserting his role as head tom, he made sure the other tom, Blaze, did not mount any of them. It was so hard not to get involved, but I stuck to my resolve (thanks to my husband giving me that look when I suggested getting involved). I added ample amounts of straw and hay to the turkey house for the girls to build nests. Our first turkey egg! On April 13th to be exact. I had heard stories of how turkey hens go off into the woods to lay eggs. At risk of predator attack. “Not my girls”, said I. My girls were awesome. The egg was in-house. More eggs were laid that weekend, but by the end of the weekend, only one survived. The rest were broken. I wondered whether the turkey house was too small. I wondered if they were broken intentionally. More eggs were laid and then broken over the next week. I worried and worried. Then we observed what was causing some of the damage. Rocky. Stomp dancing in the turkey house, apparently trying to impress Cornflower (who was on her nest.) He stomp-danced right on all the eggs in the house, except the ones she was laying on. Ugh. He was not the only one messing with the eggs. I found more eggs in their yard. Some intact, some broken. Two of the turkey hens were happily rolling them around with their beaks. I guess it was fun. They apparently needed nest boxes, even though everything I read stated they would make nests with hay. I put my pitiful carpenter skills to use and installed a loft in the turkey house, with large nesting spaces below. I shoved all the hay into the nest boxes. To further not get involved, I dragged a 16-foot cattle guard into their yard. The plan was to construct a natural-looking hut in their yard to lay eggs in, to prevent the roll the egg game they were playing. The turkeys were afraid of it. Those two days I played Bob the Builder in their area (yes, it takes me that long to build things), I allowed the turkeys more free-range time than usual. Their location chirps and peeps gave me a general idea where they were, but I did not have eyes on them always. There were fewer eggs laid during my building project. I wondered if my construction interrupted the laying process. Our dog, Buck, set me straight. A few days later, while he and I went for a hike, he led me off-trail. Lo and behold—a turkey nest. With lots and lots of eggs. I put the turkeys on lockdown in their area and began collecting the eggs. After a week of collecting, I popped them in incubators, thinking everything was under control. Right? After only two weeks, the incubators konked out. Not one, but both. My husband quickly built two incubators out of 5-gallon buckets. I put clean sand on the bottom of his homemade incubators and placed the eggs inside. The 5-gallon bucket incubators appeared to be working fine, but when we candled the eggs, none of them showed growth. Either they were not fertilized, or the incubators failed. We tossed them out. Over the next week, I collected more eggs. By sheer luck, we scored a Brinsea incubator on clearance. It was filled. I also tucked some turkey eggs under two broody chicken hens in the henhouse. Having covered as many bases as possible, I let the turkey hens keep any future eggs. That’s when they began fighting. Well, to be honest, the Narragansett hens claimed the house and the hut, chasing out the Bourbon hens. I needed to get involved, yet again. I moved the Bourbon Reds to a large poultry tractor away from the Narragansetts. Already predator proof, and equipped with roosting poles, I only had to construct teepee style nest areas. The very day they moved in, Blaze mounted each of his girls. 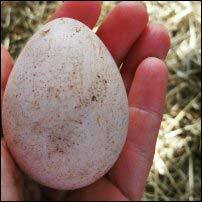 Exactly two months after the first egg was laid, the first turkey egg hatched. It was in the Brinsea incubator. The wet, squished up little poult exiting its’ shell was one of the most beautiful things I had ever seen. The next day another one hatched. Then two the day after. 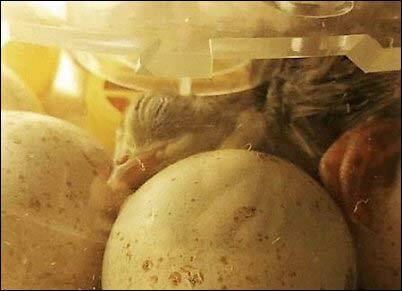 Some began to hatch under the hens in the henhouse. Day after day, eggs hatched. 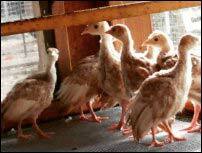 Each poult was fluffed under a heat lamp before it was placed in a brooder. When eggs began to hatch under the broody Narragansett turkey mama, I attached a makeshift screen door under the loft to keep them safe, added a chick waterer and feeder, and hoped for the best. Everything went fine, until a few mornings later, when I delivered breakfast. Several dead babies were outside of the nest. Underneath her, were a few live poults, but also several shell-stripped eggs. It looked like the shells were pecked off from the outside, leaving the membrane to dry. I peeled the membrane to see if any survived, but it was not to be. Unsure what exactly happened, but uncomfortable leaving the remaining babies, they joined the poult party in the house. After that day, I began removing her babies as soon as they hatched. Mama turkey was irate. I was none too pleased crawling face first into a hut to remove babies from a broody turkey hen. Eggs hatched all over the property. Babies filled three brooders. When we finally had a lull in hatching, I transitioned the oldest poults outside by moving them to one of the portable chicken tractors during the day, bringing them back in at night. By the end of June, all but a handful of poults (the ones not yet feathered enough) were moved to a safe outdoor brooder. One hot summer day, rotten eggs began exploding all over the property. Have you ever smelled that? The word that comes to mind is death. I disposed of all unhatched eggs that very day. The outside poults were eating well, growing, feathering out, playing, etc.…Then one evening, something unexpected happened. At bedtime, everyone was fine. Yet, when I did the late-night rounds, all the turkey poults were crammed in a corner. It was not even slightly chilly. It was a hot summer night. In a panic, I separated them. At the bottom of the poult-pile were several dead babies. Unsure what had gone wrong, by headlamp, I moved the entire lot of them back into the house. The Bourbon Red eggs started hatching under their mama. Ember was a mellow hen, and they were in a secure enclosure. I was hoping she would make a good mother. For two days eggs hatched. So far so good. Then on day 3, I found a dead baby outside the nest. After burying too many babies that summer already, I could not bring myself to lose anymore. I took all of them away from her. I reset up another brooder in the house. Under the heat-lamp they went. We had a full house again. So much for that vision of letting mother nature—and the turkey mamas—do their thing. I was the turkey mama. The hens continued laying eggs. I continued collecting them. Instead of incubating, we opted to scramble the eggs and feed them as treats to the many baby turkeys on the property. We moved the Bourbon Reds’ out of the tractor and into a new coop of their own. Ember was gentle, and she ran to visit her babies in the brooder every time I let her out. I decided to let her build a nest in her new house. The many turkey babies were doing great. We had lots of cross breeds and a handful of pure varieties. We traded some young turkeys for an abundance of fruit we did not grow or did not have a good crop of that year: Peaches, apples, raspberries, and blackberries. I also traded a breeding trio of young turkey for 16 young quails. A venture I had been wanting to get into. During Labor Day weekend, Embers’ eggs hatched. I doubt there was a nest that was more monitored than hers. One sign of trouble and I would take the babies away. To our relief, for the first two weeks, there was no heartache. Only joy. Ember was an amazing mama and her young were both friendly and curious. It was exactly what I envisioned when turkey breeding began. After two weeks, things changed. The yard was designed for babies at least a month old. If the poults stayed with mom and dad in the yard until then, they would be fine. However, at two and a half weeks old, they were much more adventurous than I had planned. Still tiny, they were able to slip through openings and wander outside the yard. Our small farm was in full swing with the rest of our critters, gardens, etc. Instead of using valuable time and energy to shore up the entire yard, I moved the babies to a small chicken tractor. Ember checked on them when free-ranging, but she seemed okay with them not being with her. She was more interested in foraging and taking dirt baths. On Halloween, we processed all the summer babies. Regardless of size. Regardless of weight. 51 in all. We set aside a number of them to gift friends and family, who would otherwise never taste a homegrown heritage turkey. 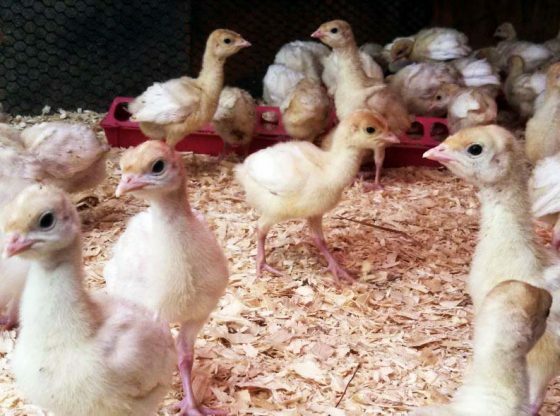 Larry built new turkey houses with nest- and baby-friendly features for the Narragansetts, the Bourbon Reds, and the new additions, a breeding pair of Midget White heritage turkeys. Ember and Blazes’ babies moved into their parents coop-the one they were born in. The turkey hens still laid eggs. I collected and scrambled them up for the Bourbon Red babies. Thankful for my husband for creating our small farm with me and allowing me to embrace farm life fully. Thankful we were able to give away many heritage turkeys to families to enjoy this Thanksgiving (“Turkey Day“). Thankful for all the turkey in our freezers. Thankful for the three breeding pairs I get to keep as pets. Thankful for the 14 Bourbon Red “babies” I get to keep. Thankful the toms have stopped fighting, and the hens are getting along again. Especially thankful that they FINALLY stopped laying eggs last week. As much as I love babies, I honestly do not care to see another turkey egg for a long time. I am also thankful for the lessons we learned. 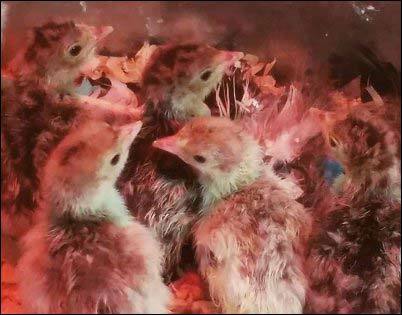 With new knowledge and experience, we are better prepared for turkey breeding next year. Gobble, gobble!